No Google slides, 'scream or smoothies at this year's MWC? Those jonesing for a Google badge at this year's Mobile World Congress could be out of luck as the Mountain View team might not do Barcelona in the same way it has in year's past. "I can confirm that indeed, [Sonia, writer of the test-mobile.fr report], we will not stand at MWC this year," read a translated statement provided by Google France to the site. "However, the Android team will be present in Barcelona to support its partners." Google doesn't really need to man a massive booth to build buzz and win Android OS converts, so if it doesn't decide to have a stand presence at MWC 2013, we wouldn't be surprised. Just a little disappointed. 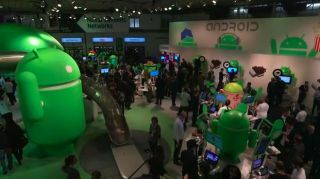 Smoothies, claw games, robots, slides, a train of encased smartphones...Google's MWC 2012 booth was a feast for the eyes and a treat for techies. Fun aside, a non-booth presence may be all Google needs come the end of the month, particularly if it wants attention to focus on its Android partners, not its show schwag. Google I/O is slated for May, so it's plausible the G-team is scaling back in preparation for fun (and significant) times ahead at the San Francisco gathering, where it also won't have to share the attention with anyone else. And there will still be plenty to get jittery about at MWC, even if we're not running on Google-supplied ice cream sandwiches. LG hinted earlier Wednesday that it has a new line of phones ready for a Spain reveal, while Huawei has a pair of devices it's eager to show. That's just the tip of the iceberg. Though the show won't lack for distractions, it might take us a minute to recover if there aren't any badges.